Screenwest and SBS have greenlit one short film and a short comedy series as part the Scripted Short Form Content Initiative which aims to support emerging Western Australian filmmakers from under represented diverse groups. Since announcing the program last year, Screenwest and SBS have worked with creative teams around the state to select projects that reflect the initiative’s aims of promoting greater diversity within the screen industry to share multicultural and Indigenous stories otherwise untold and give a voice to communities often unheard. Successful applicants took part in an intensive series of development with two projects being selected for $80,000 each in production funding. “The initiative has been a brilliant leg-up for emerging Western Australian filmmakers, giving them a unique opportunity to work directly with network executives and better understand the demands of the market,” said Screenwest Scripted Executive Ross Grayson Bell. Synopsis: An odd couple comedy about a bigoted white pensioner and an Aboriginal student forced to live together. On the set of MOLLY AND CARA. L-R: Emilia Jolakoska (producer), Lynette Curran (Molly), Hayley McElhinney (Dee), Miley Tunnecliffe (director) and Rarriwuy Hick (Cara). Photo by Danni Booth. Synopsis: A harried interpreter must go beyond her professional boundaries, in the face of an antagonist tribunal, in deciding the fate of an asylum seeker. Behind the scenes of TRIBUNAL. 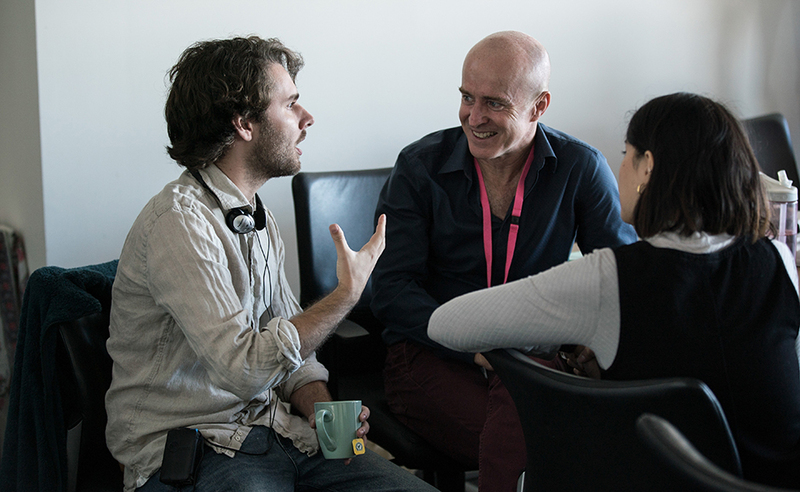 L-R: Mason Fleming (director), Screenwest Scripted Executive Ross Grayson Bell and Hannah Ngo (producer). Photo by Liang Xu. The two projects will premiere on SBS’s streaming platform, SBS On Demand, later in 2019.